Using a combination of Rory’s Story Cubes® and their own imagination, players become the characters that star as the heroes in self-contained episodes. After setting up the initial story, you’ll ask questions about what’s happening, then roll the Story Cubes to get your answers! Flip Outcome and Reaction cards to see if your attempted actions come off without a hitch, or fail miserably, pushing your story in a completely different direction. Face off against world-conquering supervillains or experience a not-so-average day at the office - anything can happen in Untold: Adventures Await! Untold: Adventures Await gives players of all ages and skill levels the opportunity to experience storytelling like never before. With an emphasis on working as a team to create an enjoyable story, players will collaborate and help each other out to ensure that their tale has the best result possible. However, the inclusion of Rory’s Story Cubes and the Outcome and Reaction cards mean that not everything will go exactly as planned! Taking around an hour from set up and character creation to the climatic final, Untold offers accessible adventuring at its finest. 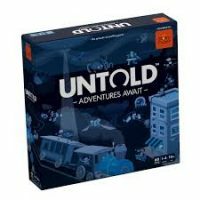 Add a Review for "Untold: Adventures Await"